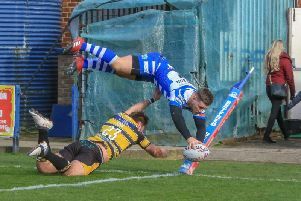 In-form centre Steve Tyrer has warned Halifax’s Championship rivals that their new-look left side attack will only become more dangerous as the season goes on. Boss Richard Marshall lined up Tyrer, playing his first game since September after close-season surgery, and back rower Dane Manning alongside new recruits Gareth Moore and Will Sharp in Sunday’s 52-6 win over Whitehaven. And the quartet tore the Cumbrians apart, Tyrer bagging four tries, Moore and Sharp both touching down and Manning presenting a constant menace whenever the ball moved left. “It was a good start, but it’s only going to get better as the year goes on,” said Tyrer, who will look to add to his points tally at Sheffield on Friday night (8.0). “We saw me and Will break down a couple of times and get it wrong in the second half, but it’s our first game together. “But Gareth brought a bit control to that side and I think it will be more consistent than it has been over the last couple of years. “We’ll see how we go at Sheffield on Friday now; they are a full time team and our aim is to ruffle some feathers when we play against those sides. Tyrer’s 32 point haul against Whitehaven was enough to give him a share of the club’s points in a game record, a mark set by another centre, the former All Black John Schuster, in 1994. Tyrer admitted he had been unaware of how close he was to the milestone, which he finally equalled with a late sideline conversion of James Saltonstall’s try after turning down a simple penalty attempt two plays earlier. “I wasn’t aware of it at all; we got a penalty at 46-0 and the bench are shouting ‘take two’ and I’m thinking ‘What? You don’t take two at that kind of score?’,” he laughed. “That’s why we didn’t do it, but it worked out in the end. “It’s different eras and different players, but it’s always a pleasure to be able to stand alongside a player like that. “I’m happy playing here and things like that just add to it.